NVIDIA’s GeForce RTX 20-Series has hit the GPU market like no other in recent years, generating plenty of discussion and debate due to performance, features and… you guessed it… price. It’s been difficult to get away from that particular spectre at this feast, and so it’s something of a relief to finally come to the more affordable end of the GeForce RTX 20-Series spectrum: the RTX 2070. However on the test bench today isn’t just any old RTX 2070. No, we’re taking a look at the Republic of Gamers GeForce Strix RTX 2070 OC from ASUS, a premium design with top-end cooling, maximum factory overclock, and plenty more besides. As part of NVIDIA’s RTX 20-Series it also supports their proprietary GeForce RTX features, features such as Real-Time Raytracing and Deep Learning Super Sampling as well as those developed and released in the future. While the ROG Strix OC models sit at the top of the available models from ASUS, there are nonetheless plenty of card options to choose from if ASUS are your manufacturer of choice. As well as a trio of ROG Strix variants, three more are branded with their mainstream DUAL moniker, while a further card is an entry-level TURBO variant. Each offer different out-the-box cooling and OC options while sitting at divergent price point at or above NVIDIA’s $499 MSRP. While the RTX 2070 may have an MSRP of $499, that figure is perhaps a little disingenuous when looking at the range as a whole. Indeed at $599 the NVIDIA Founders Edition has the benchmark price point many will approach the series from. However you look at it, the card will be compared closely with the options from previous generations currently sitting at around the same street price, namely the GTX 1080 and GTX 1080 Ti. That puts it in a tough position; by rights drawing a generational distinction between the RTX 2070 and GTX 1070 and assessing performance accordingly is fair, or at least it would be if it could match the GTX 1070’s $379 launch MSRP. Nevertheless, ROG’s Strix RTX 2070 OC variant is a considerable step up in specifications, expected performance and price over even NVIDIA’s Founders Edition. 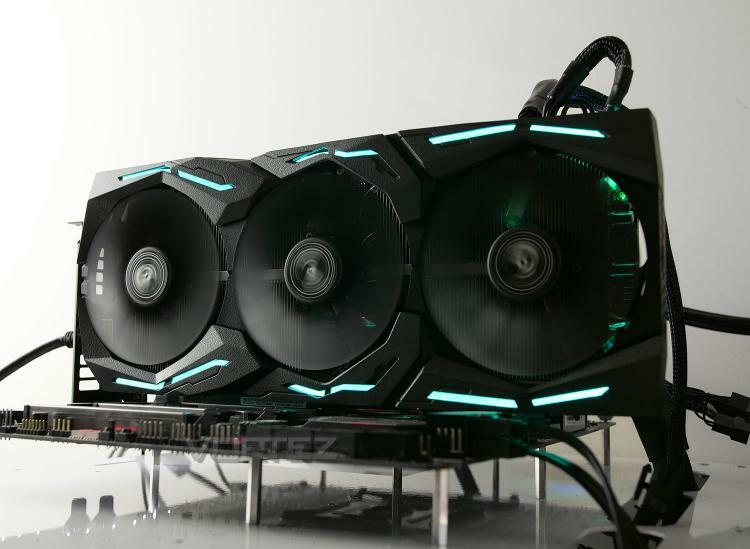 Most obvious is the now familiar Triple-Fan cooler with RGB LED lighting, a hallmark of Strix GPUs for a couple of generations now, but with a maximum boost clock of 1845MHz it will (on paper) wipe the floor with the vast majority of its rivals. You might be expecting an outlandish price alongside cutting-edge performance, but in this instance the premium isn’t quite so eye-watering. The ROG GeForce Strix RTX 2070 OC is currently available in the US for $629, only $30 more than the less well-appointed Founders Edition. However UK pricing is far less comfortable as the card sits at £669 inc. V.A.T.. Despite this, a multitude of aggressive launch deals being available mean you certainly shouldn’t discount ROG’s top-end RTX 2070 out of hand. And now, without further ado, it’s time to take a deeper look at this card’s technical specifications and features. The ROG Strix GeForce RTX™ 2070 teams up NVIDIA®'s A-list GPU with an elite cast of specialists, setting the stage for epic gaming action. Gargantuan power delivery provides the muscle to push overclocking boundaries, while cooling that's honed to perfection keeps the spotlight squarely on Turing™'s performance. And with an arsenal of utilities that allow you to customize and tweak this extreme hardware, you call the shots.